A recent post from a doula has given the thumbs up for any pregnant woman choosing to use an epidural – something that writer and mum Katy Anderson is very happy about. 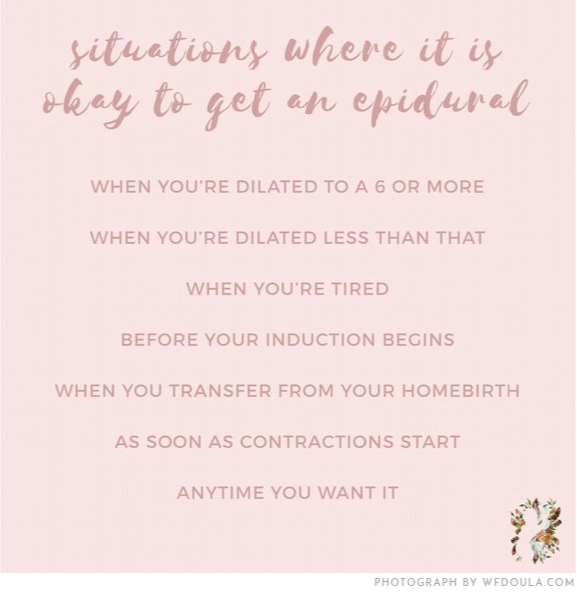 The Reddit post, created by Wild Flower Birth Services, lists the situations when it’s okay to get an epidural. As Katy points out, doula births are usually associated with avoiding pain relief and aiming for a natural, intervention-free birth. However, this post was surprisingly blunt, says Katy. “What it basically boiled down to is that a woman should get an epidural if and whenever the hell she wants!” she wrote in her recent Mom.me story. And it’s this last point that has Katy and many other mums cheering, because the choice to use an epidural should be up to no one but the woman herself, argues Katy, who described her experience of being pressured to skip pain relief during her third birth, despite her clear requests for an epidural. “When I went to the hospital to deliver my third child, I felt like a veteran. “I’ve got this,” I told myself. Then I was faced with an unforeseen complication: an aggressive nurse who continually shamed me for wanting an epidural,” she wrote. Instead of listening to Katy and respecting her wishes, this nurse tried to convince Katy that she’d be disappointed in herself if she opted for an epidural. In intense pain, Katy figured she had reached her limit and asked the nurse to send for the anaesthetist to organise the epidural. But once again, this nurse disregarded Katy’s requests, insisting that she continue labouring without pain relief. Every woman is different, argues Katy. While some want to try for a natural birth, others will want pain-relief from the start, and they should be supported for whatever their birth choices are. She also points out that there are misconceptions about when it’s okay and not okay to ask for an epidural, and women should be fully informed about these so they can make their own decisions during the birth.